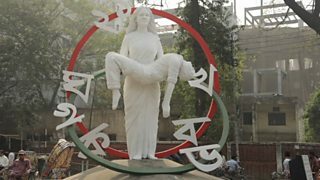 A Dhaka statue of a mother holding her dead child, killed in the 21 February protests.The words spell out 'mother tongue'. All writers and broadcasters strive to make the best choice of language: in some parts of the world, making the right choices can be a tricky business. On my latest assignment for the BBC Academy in Bangladesh I had an insight into the complexities of linguistic division that journalists there deal with day to day. I was in Dhaka to prepare for the launch of the latest new BBC Academy website, aimed at Bengali-speaking journalists. Bengali is Bangladesh’s national language but also the second most spoken language in India. 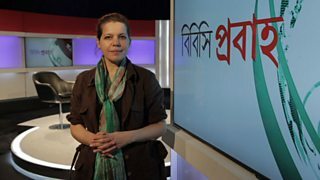 As with many other BBC language services that broadcast to wide and diverse audiences, the BBC Bengali service aims to use language which will be commonly understood. But as elsewhere in the world, the same language spoken in two countries (in this case, India and Bangladesh) has different terminology, usage, accent, and pronunciation, depending on where it’s being spoken or heard. For some context, language holds a particularly important place for the people of Bangladesh. The Bengali people fought long for recognition of their own language – their latest struggle beginning in 1947 when the territory was separated from India. It became part of the newly-created Pakistan and Islamabad made the Urdu language the official language of East Pakistan as Bangladesh was then known. The struggle for recognition of the Bengali language became part of the battle for independence from Pakistan. The Bengali Language Movement emerged in 1948, just after the division of India, and on the 21 February 1952, students from the University of Dhaka were shot dead by police as they protested in support of language rights. After Bangladesh won its independence in 1971, 21 February was commemorated as Language Martyrs’ Day (Shaheed Dibash). Since Unesco recognised the date as International Mother Language Day, in the late 1990s, Bengalis have observed 21 February as both. Najiba Kasraee on the set of a BBC Bangla weekly TV show from Dhaka. Day to day, the job of the BBC Bengali Service is not only to cater for the two separate countries, but also to bear in mind linguistic differences between the Muslim and Hindu communities in both Bangladesh and India. BBC Bangla’s approach is to use both, depending on the context, Mustafa says: “What to call water may sound quite harmless, but what about the word God? Which word should we use here – ‘Allah’ or ‘Bhagavan’?” His solution was to use the word ‘Creator’. Much of this kind of knowledge and nuance is already embedded Mustafa’s team, but having a BBC Academy training site in Bengali, where language sensitivities can be collated and updated, will be a valuable resource, particularly for new journalists, he says. The site will also have content on journalism skills and news values such as impartiality and independence. “Being impartial and independent is one of the most important qualities we have in the local market – it’s our identity,” explains Waliur Rahman Miraz, the BBC’s Dhaka bureau editor. As in some other South Asian countries, journalism is closely associated with activism in Bangladesh and to be impartial is often a difficult concept to grasp. Many of the country’s media organisations follow an agenda – be that the government’s or that of their commercial owners. “There is no grey area: you are either for or against a view or a stance, with very little room for anything in between,” was how one senior independent journalist explained it to me in Dhaka. The Academy site in Bengali aims to create vernacular training content that offers a guide to accurate and independent reporting. And as a bespoke resource, it will reflect Bengali culture in the images we use, as well as the words. 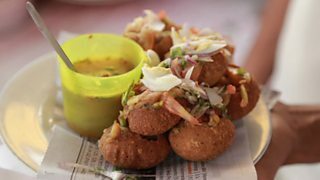 What better way to badge our ‘Bitesize’ style guide section than with a photo of a delicious-looking street food snack called Fuchka! The BBC Academy’s Bengali site will launch later this year. Four other new journalism training sites in Spanish, Somali, Kyrgyz and Ukrainian will also be added in 2016, bringing our total number of international language websites to 23.